A team of five Year 9 students from Rydens Enterprise School (RES) took part in this year’s Go4SET project set by EDT and hosted by BP. The students were given 3 STEM challenges on ‘Challenging Environment’ and had to tackle two of them. 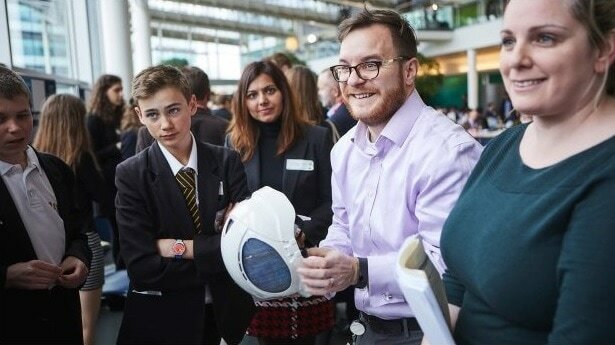 RES students took on a six month project to design the best prototype for the ‘Keeping Cool’ challenge where they had to design a cooling hard hat for BP employees to wear in hot countries to keep them cool. The other challenge ‘Keep Hydrated’ was to design a way to collect purified water for employees who will be in a middle of a sea with no water. The fantastic news was that the team - Harrison Ahmad, Emil Hughes, Matt Hall, Rhys Heather and William Bewsey - were awarded the winners of the best prototype design for their hard hat in the finals. Overall the RES students were awarded 3 certificates; a National Award for their contribution to the Challenging Environment project, a Bronze Award for industrial cadets and a Silver Crest Award. As well as being winners of the prototype award, the students made the made the front page of the BP Newsletter!